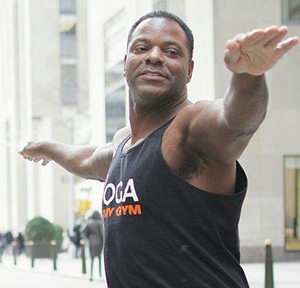 In 2006, former NFL Linebacker Brian "BJ" Jones began a journey that transformed his life and led to the inception of Yoga Is My Gym. Jones was raised in West Texas by his grandmother, who provided the tough love that kept him motivated and determined to succeed. The first in his family to go to college, he became a star football player for the Longhorns at University of Texas-Austin. BJ's success continued during his five years in the NFL, where he played for the Indianapolis Colts (1991) and the New Orleans Saints (1995-98). A life lived in the fast lane fell apart after retiring from the NFL; Jones sought direction, exhausted his wealth and ended up broke. The mantra of a mentor pulled him through, remembering the words of his high school coach Jerry Lee: tough times don't last; tough people do. BJ's grit allowed him to pick up the pieces of his life, going back to school and reinventing his life in broadcasting. Today Jones is a CBS Sports Network Analyst and co-host of national sports talk radio show "Gio and Jones," and these days, he stays humble, grounded and strong with yoga. BJ's love affair with yoga started in 2006 when longtime friend Blake Hall introduced him to power yoga at an Austin studio. BJ was a lifelong athlete but never even considered stepping foot onto a yoga mat, assuming the practice wasn't for anyone serious about physical fitness. Nonetheless BJ dove headfirst into foreign territory. He walked out totally hooked—invigorated by the challenges and "sore as heck." Yoga allowed total transformation. It quieted his mind. He achieved more core strength than ever, discovered new muscles and felt like himself again, in the best ways possible. And BJ wasn't the only one taking notice of his newly slim and toned physique. Friends were astonished, asking what he was doing at the gym to stay in shape. BJ's response? "Yoga is my gym!" The phrase stuck. BJ founded Yoga Is My Gym in 2007, selling his tees out of a box after classes. Grassroots sales evolved over the years, as Jones launched an online store and trademarked Yoga Is My Gym in 2014.
a yoga movement for real people with real results. © Yoga Is My Gym. All Rights Reserved.